Our guide to Colorado Springs will help you find the best dog friendly places in Colorado Springs Colorado. With vast, rolling plains to the east and Pikes Peak towering at 14,000 feet to the west, Colorado Springs is enveloped in glory. Magnificent red sandstone pinnacles at the base of the mountain have been dubbed appropriately, "Garden of the Gods." The city itself — the second largest in Colorado — is adorned with beautiful Victorian homes and turn-of-the-century buildings. Once known as a Gold Town, Colorado Springs now boasts something for everyone, from the arts buff to the outdoorsman. Popular family attractions include Pikes Peak Ghost Town, Old Colorado City, and Manitou Springs. Gorgeous views of the Continental Divide can be seen from the Manitou & Pikes Peak Cog Railway. There are tons of great dog friendly places in the city of Colorado Springs, our city guide will help you find the best dog friendly places. You may have a hard time deciding what to do in Colorado Springs, but we make your decision easy. Canoe Creek Dr & Charmwood Dr, (719) 579-9488 - Cheyenne Meadows Dog Park is a dog friendly off-leash dog park located in Colorado Springs CO.
N 30th St, (719) 634-6666 - The Garden of the Gods Park, is a Registered National Natural Landmark in Colorado Springs. 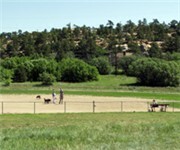 N Union Blvd & Lexington Dr, (719) 235-3670 - Rampart Dog Park is an enclosed off-leash dog park in Colorado Springs. Paseo Rd & Maizeland, (719) 385-5940 - Palmer Park Dog Park is a baseball field turned into an 'off-leash' dog area. 1 Lake Ave - The Broadmoor is a dog friendly hotel / motel / resort located in Colorado Springs CO. There are plenty more dog friendly places in Colorado Springs. See all dog friendly places in Colorado Springs Colorado.